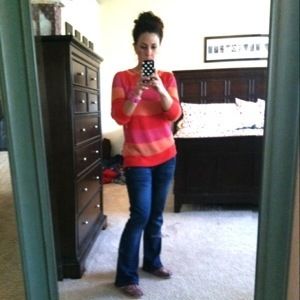 I bought this sorbet striped sweater at Costco of all places, it is by 525 America. After checking out the 525 America website, I feel like I got an amazing deal. The price points of most of their merchandise begin around $50. I liked this light weight sweater so much, that I went back to Costco this weekend and bought the same sweater in mint, green, and blue stripes! One thing to consider when buying clothes from Costco; many manufacturers make a lower quality of clothing for wholesale retailers and outlet stores, many of the items are the same quality sold at regular retailers, it just depends on the item. 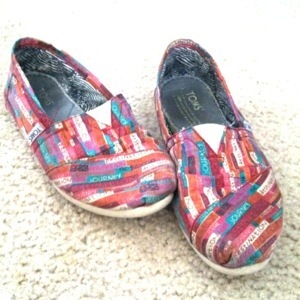 I love wearing Toms Shoes! They are so comfy, especially for people like me (teachers) who are on their feet all day. I know they are not for everyone, but I love them. I bought these gently used on eBay. I know you are thinking, “Gross, used shoes!” But consider this, if you have ever gone bowling you have worn used shoes, unless you own your own! When I purchase used shoes on eBay, I always make sure I am buying something that I already know my size and that it will fit. When they arrive in the mail I thoroughly spray them with deodorizer and Lysol. I like to think of eBay as a giant online thrift store. Try the search option of “Used” you will be amazed at the great deals. 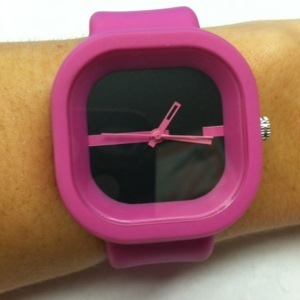 I found this cute magenta watch this week at Target with a wonderful red clearance sticker. All of the “winter” items are clearanced. I am not into “seasons” or the idea that certain items like this watch can only be worn during one time of year. I think it will be great for spring and summer. Part of being frugal and wise when shopping is to pick items that will go with your wardrobe and are versatile enough to be worn throughout the year, when possible. TGIF! What is your opinion on color blocking stripes? Are you a fan or not? Thank you so much! I agree with you, there are a lot of great options at Costco besides bulk TP!